Mood disorders are significant comorbidities and frequently undertreated, despite growing evidence of benefits of treatment. It seems intuitive that stroke survivors, especially those facing significant disabilities, experience mood disturbances at some point during their recovery. Feelings of hopelessness, worthlessness, guilt, sadness, and tearfulness along with sleep and appetite disturbances, are common among stroke survivors. These symptoms are often unrecognized as significant comorbidities and are frequently undertreated, despite growing evidence for the beneficial effects of available pharmacologic and behavioral interventions. Clinicians caring for stroke survivors are often faced with a variety of complaints that are difficult to discern and can be indicative of a mood disorder. Most clinicians focused on stroke are not well-equipped for tackling these symptoms and may lack the training and expertise to screen and diagnose mood disorders. Often, because of the need for simplicity and lack of time, these complaints in patients who have experienced stroke are overlooked. 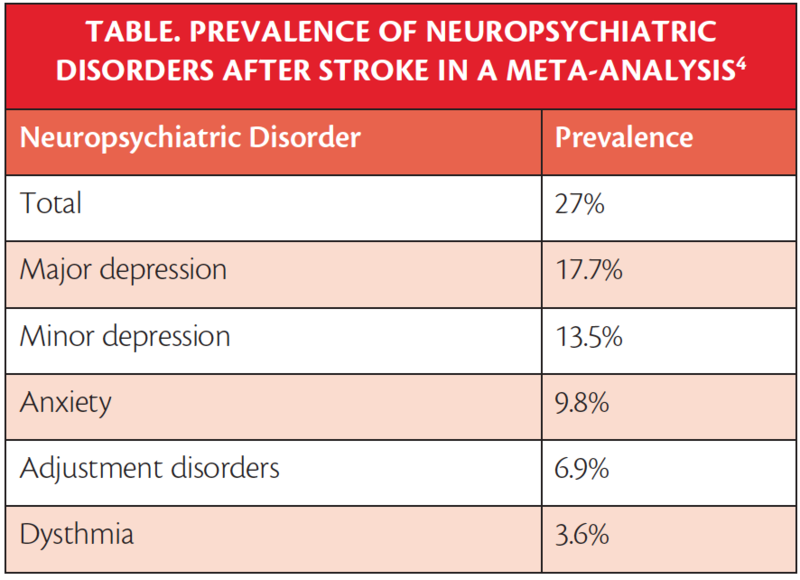 Mood disorders that develop after stroke are diverse in presentation and become additional stressors for patients and caregivers, negatively affecting their quality of life. There are conflicting data regarding predictive factors for depression and other mood disorders after stroke. The complex association between demographic factors, comorbid conditions, clinical outcomes (eg, stroke severity, type of disability), and premorbid psychological issues as potential risk factors have been the topic of much research. 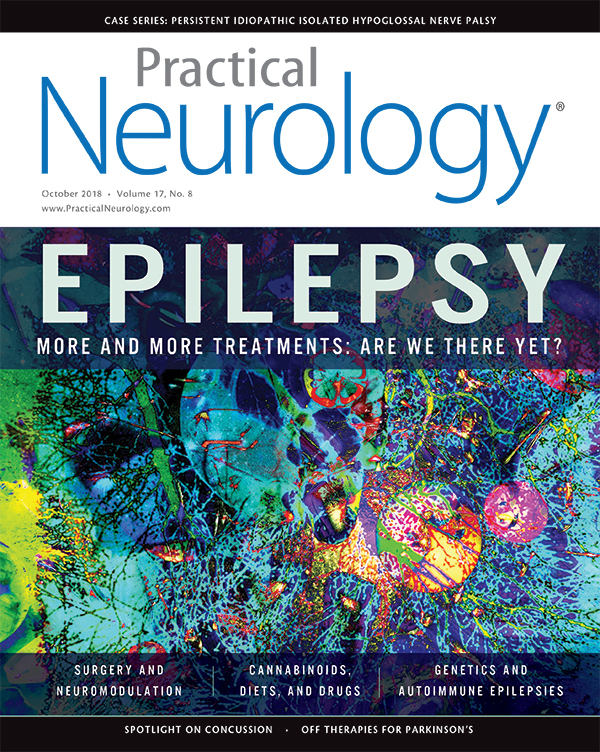 History of prior depression, type of functional impairment, the presence of cognitive deficit, and stroke severity have been commonly reported in several studies as risk factors for PSD.2,3,5 Studies have also investigated the potential impact of stroke-related features such as size, location, and lateralization. Despite extensive research, systematic reviews have shown that neither the anterior-posterior nor the right-left hemispherical localization of the lesions is a risk factor.6,7 In a recent meta-analysis, it was reported that a relative risk of major depression was 50% higher and the relative risk of any depressive disorder was 26% higher following left (dominant) hemisphere stroke.7 Large lesion volume, silent infarcts, and subcortical small vessel disease are linked with increased risk of depression after stroke.6,7 Review of the proposed pathophysiology of mood disorders after stroke is beyond the scope of this manuscript. The high prevalence and diverse manifestations of mood disorders in patients recovering from stroke and growing evidence that family members and caregivers may also experience depressive symptoms emphasize the need for a system of care that ensures consistent clinical practices across settings. Despite growing knowledge and understanding of the phenomenology, predicting factors, and pathophysiology of these entities, many questions remain unanswered, and further research is needed. 1. Folstein MF, Maiberger R, McHugh PR. Mood disorder as a specific complication of stroke. J Neurol Neurosurg Psychiatry. 1977;40(10):1018-1020. 2. Salter K, Mehta S, Wiener J, et al. Post-stroke depression and mood disorders. In Teasell R, Cotoi A. (eds) Evidence Based Review of Stroke Rehabilitation. http://www.ebrsr.com/. Updated March, 2018. Accessed September 14, 2018. 3. Ferro JM, Caeiro L, Figueira ML. Neuropsychiatric sequelae of stroke. Nat Rev Neurol. 2016;12(5):269-280. 4. Mitchell AJ, Sheth B, Gill J, et al. Prevalence and predictors of post-stroke mood disorders: a meta-analysis and meta-regression of depression, anxiety and adjustment disorder. Gen Hosp Psychiatry. 2017;47:48-60. 5. Eskes GA, Lanctôt KL, Herrmann N, et al. Heart Stroke Foundation Canada Canadian Stroke Best Practices Committees. Canadian stroke best practice recommendations: mood, cognition and fatigue following stroke practice guidelines, update 2015. Int J Stroke. 2015;10(7):1130-1140. 6. Carson, A. MacHale S, Allen K, et al. Depression after stroke and lesion location: a systematic review. Lancet. 2000;356:122-126. 7. Wei N, Yong W, Li X, Zhou Y, et al. Post-stroke depression and lesion location: a systematic review. J. Neurol. 2015;262:81-90. 8. Prisnie JC, Fiest KM, Coutts SB, et al. Validating screening tools for depression in stroke and transient ischemic attack patients. Int J Psychiatry Med. 2016;51(3):262-277. 9. Menlove L, Crayton E, Kneebone I, et al. Predictors of anxiety after stroke: a systematic review of observational studies. J Stroke Cerebrovasc Dis. 2015;24(6):1107-1117. 10. Bennett HE, Thomas SA, Austen R, Morris AM, Lincoln NB. Validation of screening measures for assessing mood in stroke patients. Br J Clin Psychol. 2006;45:367-376. Erratum in: Br J Clin Psychol. 2007;46:following 251. 11. Hackett ML, Anderson CS, House A, Halteh C. Interventions for preventing depression after stroke. Cochrane Database Syst Rev. 2008;16(3):CD003689. The author has no financial or other relationships to disclose.